LinkedIn has finally gotten around to updating the design of its site in an effort that has been in action prior to Microsoft scooping the company up. What was once a pretty straightforward but dull design is now a more modernized design as it takes notes from popular social media sites. The goal of the redesign is to make it more visually appealing and also make it easier to get around. The top of the site features several sections with drop downs to assist with navigation so everything comes off cleaner than before with a lot more space below that bar to view news, comments, and updates. You still get suggested people to connect with on the side of course, but with content from other people you don’t follow or do follow, you can hide those. LinkedIn also included a messaging feature so you can chat with people your follow or potential clients live. 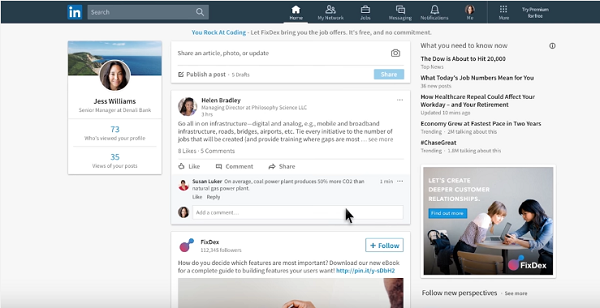 Overall LinkedIn made significant changes to its site that are sure to appeal to users already there and will likely bring users in or even bring them back. You can check out the video detailing more of the site updates here.